Join us this summer for the 31st Annual ShopRite Nutmeg State Games Shooting Competition hosted by the City of New Britain! This is a great opportunity to compete in a statewide tournament in Central Connecticut. This year's Shooting Competition will be hosted by Blue Trail Range in Wallingford. The Shooting Competition will be coordinated by Deb Lyman. Air Rifle (60 shots/males ~ 40 shots/females; rifles available for use). Email Deb Lyman at deb@BlueTrailRange.com for relay time. Fired in the Air Rifle Range. Additional relays can be squadded if required. 8AM - Nutmeg State Games Smallbore Rifle 3-Position Match. No later please! 9AM - 40 shots prone, standing, and kneeling at 50 yards. Metallic Sights. A23/5 Target. Senior Category can fire scope—50 years or older—as of 12/31/19. 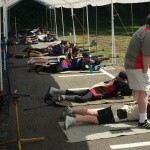 8AM - Nutmeg State Games Smallbore Rifle Registration. No later please! Seniors can fire scope—50 years or older—as of 12/31/19. ​​​AWARDS: An awards ceremony will be held at the completion of the match—(not to last longer than 15/20 minutes)—please wear t-shirt for ceremony! Gold – Silver – Bronze Medallions are awarded in each of the events based on the total number of competitors in each region and in each age category. Males and females compete in their own class. Please click here to be directed to the Blue Trail Range Website. Through December 31st of the calendar year in which his/her 14th birthday occurs. From Jan. 1st of the calendar year in which his/her 15th birthday occurs through Dec. 31st of the calendar year in which his/her 17th birthday occurs. Through Dec. 31st of the calendar year in which his/her 20th birthday occurs. From Jan. 1st of the calendar year in which his/her 21st birthday occurs through Dec. 31st of the calendar year in which his/her 40th birthday occurs. From Jan. 1st of the calendar year in which his/her 41st birthday occurs through Dec. 31st of the calendar year in which his/her 55th birthday occurs. From Jan. 1st of the calendar year in which his/her 56th birthday occurs. Small Bore (metallic sights only) except for Senior Category (Seniors may shoot with scopes). NRA rules govern the Smallbore shooting events. Metallic sights. Seniors can use scope (50 years or older—as of 12/31/14). New shooters can be placed in “tyro” category for smallbore rifle for own awards and can be coached. NRA International rules will govern air gun events (with the exception of the clothing requirement). Competitive Qualification through NRA Approved and Registered Matches.You have the option to either Register ONLINE or by HARDCOPY - You do not have to do both! If you do not reside in Connecticut and your state games program does not offer shooting you are eligible to compete in another state such as the Nutmeg State Games.